To speed up the event check in process, we will be issuing a QR code system. We are highly encouraging PRE EVENT registration to assist in this process. Step 1: Please register and pre-pay online before the luncheon. Step 2: You will be sent an email with a QR code. Step 3: Print the QR code or have it ready on your phone to show when you check in. Members: $12 by 11:30 am on previous Friday; then $15. Registration the day of the event is $20. Note: When registering online, discounts will be applied during checkout. For Chamber functions involving reservations: reservations not canceled at least 48 hours in advance, refunds will not be available. At that point, we have already given a solid headcount to our caterers and you should come anyway. You never know what you are going to miss. You may give your QR code to another person for entry. So, if you cannot attend, bonus someone else. 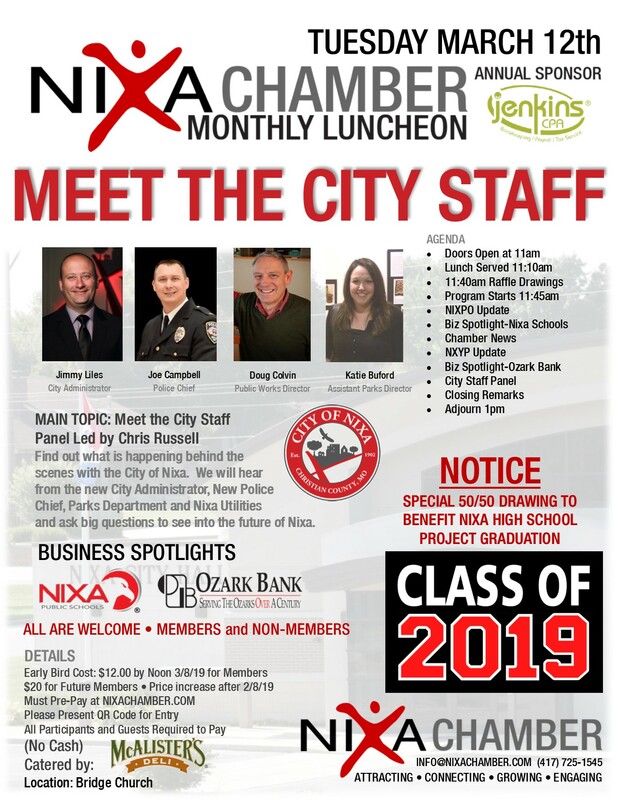 Find out what is happening behind the scenes with the City of Nixa. We will hear from the new City Administrator, New Police Chief, Parks Department and Nixa Utilities and ask big questions to see into the future of Nixa.